The theme for our combined Weekend Cat Blogging and Photo Hunt this weekend is natural. This complements a theme from a year ago, artificial. At that time, we explored the interplay of Luna’s natural beauty with her artificial surroundings. Especially in light of my recent experience with New Topographics, it seems like an appropriate subject to revisit. We often explore the interplay between Luna’s naturally curving biological body and the straight lines that dominate the art and architecture of her surrounding environment. Another bit of nature this morning, this time one that is not so welcome. These snails were a menace in our garden when I lived in Santa Cruz where they seemed to arrive in swarms. This is the first one I have seen in our patio in San Francisco in over two years. Removing it from a cactus is not a simple task. On the plus side, it was opportunity to practice with macro shot, which is not something I usually do. A sad note. Our friend Nirmanakaya’s Viandra (aka “Sniffie”) passed away last week. “Sniffie and Florida Furkids” have often visited and shared their thoughts with us on topics far beyond feline, and in turn we got to know a little about them. Sniffie will be missed, and our thoughts go out to her family. 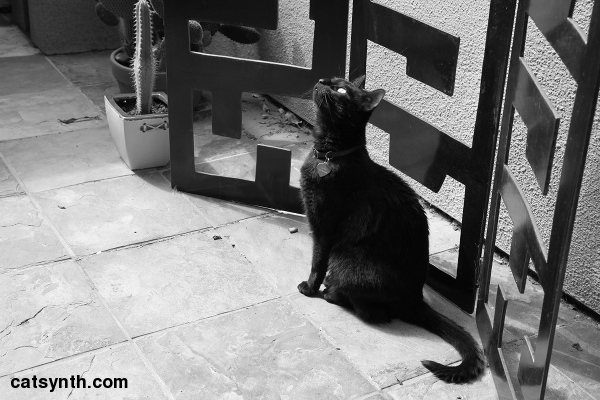 Weekend Cat Blogging #277 will be hosted by Othello (with some assist from Astrid) at Paulchens FoodBlog?! Photo Hunt #232 is hosted by tnchick.